This year OCP turns 25 years old! It might not seem a long time ago but it was way before the internet and emails, facebook, twitter and even before handheld mobile phone were used in Australia. Back then business was done the old fashioned way with a face to face sales call. The founding Director of OCP, Leyland Minter; was the master of the face to face call and I am told by branch managers that by the end of the Leyland Minter sales call you would be believing that he had come up with the idea to put Hydrogen and Oxygen together, his best mate was Albert Einstein amd he had sold you pallet of Synertrol Oil which you has no idea what it did, but you just knew you had to have it! 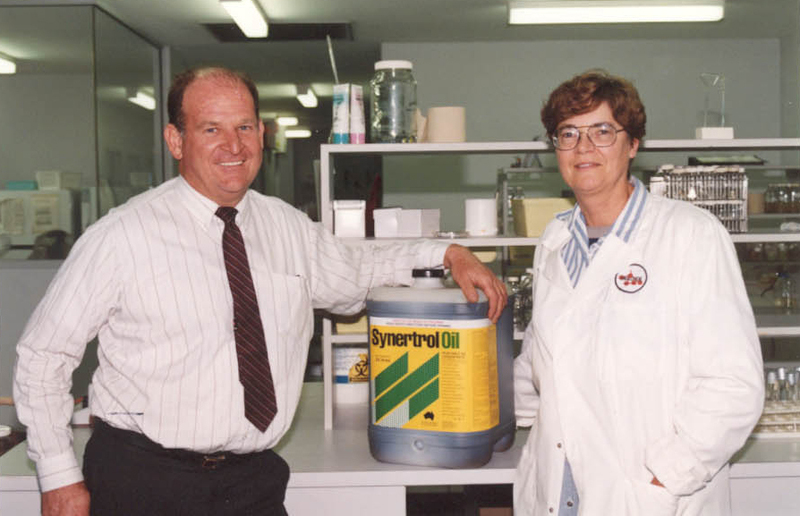 Back then Synertrol Oil was the only canola oil based adjuvant on the market and was known for its excellent drift retardant and spreading and sticking capabilities. Just like the mobile phones the number of adjuvant options has grown over the years, but Synertrol Oil and its younger cousin Synertrol Horti Oil remain very cost effective 100% Aussie grown canola oil adjuvant. Since the introduction of Synertrol Oil OCP has grown into a multi-million dollar business employing 14 staff and with distribution across all Agricultural, Horticultural and Consumer markets in Australia and with growing markets overseas. OCP has over 14 APVMA registered pest and disease control products servicing key niche organic and IPM focused market sectors. Over the past 25 years OCP has established a very strong presence in the biostimulant market working with the premium seaweed brand Acadian Seaplants for nearly 20 of those years. The recent introduction of their range of Amino acid based micro-nutrients and high N liquid and powders has seen OCP consolidate its place as a key player in the organic nutrient business in Australia. OCP’s future looks very bright due to its close association with local and foreign companies like Metcalf Biocontrol (Trichoderma), EID Parry (Azadirachtin), Andermatt Switzerland (insect viruses), ISCA (insect pheromones, mating disruption, lure & kill) and Spensa Tech USA’s OpenScout and Z-Trap monitoring technology. Crop production into the future is all about making well informed decisions about low residue, low risk, low impact products supported by crop health augmentation, this is right in sights of OCP’s field of vision which can only be a good thing for the future of modern food and fibre production in Australia!